The common pain experienced in Sjogren's Syndrome is arthralgia, myalgia, fibromyalgia, and an intermittent polyarthritis mainly in the small joints. Unfortunately these pains can not simply be removed. It is a matter of trying to make them more tolerable. Steroids may be required in severe cases. There is central fatigue associated with weariness - a worn out feeling. This is difficult to treat and can only be 'coped with' - strategies include a period of rest in the afternoon, no late nights, regular sleep time. 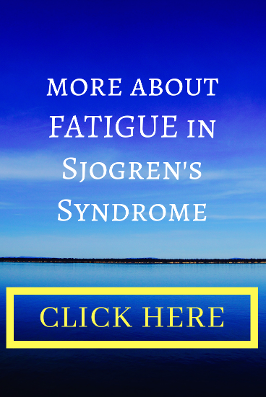 Fatigue affects approximately 50% of patients with Sjögren's syndrome but is often brought on by hypothyroidism, fibromyalgia, lymphoma, or underlying depression. There is peripheral fatigue which can be due to inflammation of the muscles. Fatigue is common in primary Sjögren`s syndrome (pSS), but what leads to that fatigue is not fully understood. They hypothesized that there is a genetic basis for fatigue, and that specific gene-variants influence the severity of fatigue. To investigate this further they performed a genome wide association study of 367 Scandinavian pSS patients. The present study is the largest GWAS of fatigue in autoimmune disease, and adds further evidence to a genetic regulation of fatigue.